Baby girl dresses include simple gowns, elaborate formal wear, casual dresses, and more. Whether you're searching for baby girl dresses for your own daughter or to give as a gift to someone else, you'll find plenty of styles for virtually any occasion. You can also find dresses to fit almost any budget, but that often depends upon where you shop. For example, stores like Target, Wal-Mart and Kmart usually offer a nice selection of baby dresses, and you can typically find dresses suitable for casual or more formal selections. Purchasing dresses at one of these department stores certainly won't break the bank, and typically, a baby girl will outgrow the dress long before it shows much wear and tear. However, if you are looking for something a bit more expensive and unique, you'll need to shop at children's boutiques or baby specialty shops, either in a brick and mortar store or on the Internet. When you're looking for baby girl dresses that are unique, what choices do you have? Smocked - Dresses that feature smocking are typically high on the list of those who want a baby dress that's really special. You can find smocked dresses at higher end department stores and children's boutiques, or you can find someone who smocks in your area. Typically, your local fabric store will have a list of people who do smocking for the public. In most cases, you'll be asked to choose your fabric, thread colors, and pattern. You may have the choice of purchasing a dress that is already made or commissioning a dress to be made and smocked. Be sure you ask to see samples of work the seamstress has already completed before you commission her for the job. Monogrammed - Purchasing a monogrammed dress is an easy way to give a one-of-a-kind gift that is sure to please. The monogram you choose can spell out the baby's entire name or simply include her initials. In some cases, dresses include monogramming and smocking for a special item that is sure to become a keepsake. Hand-painted - Adorable hand-painted fabric is the perfect choice for a summer frock. Hand-painted designs can run the gamut from flowers to teddy bears, kittens to bugs, and more. If you are doing the hand-painting yourself, be sure you use the right paints, and if you are giving the dress as a gift, be sure to include laundry instructions along with the dress. Baby dresses come in just about any color you can think of. Popular color combinations include lavender and mint green, pink and brown, blue and brown, pink and white, yellow and white, and more. From tie-dye to leopard prints, the fabrics that are available seem never-ending. In addition, styles include long and short-sleeved dresses, flutter-sleeve dresses, sundresses, etc. Shopping for baby dresses shouldn't be a difficult task. If you want to save money, however, consider the following options. Consignment shops - Here you can find new and gently used items for a fraction of the cost of clothing purchased in retail stores. In many areas, consignment sales are held a couple of times a year in which moms bring their kids' outgrown clothing and other items to sell. 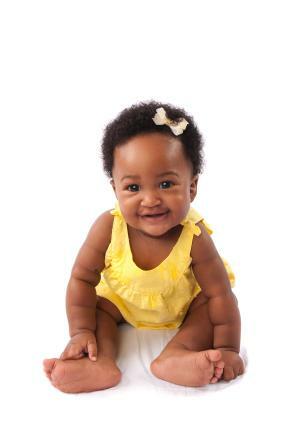 Again, you may be able to find some unbelievable deals on casual and specialty baby girl apparel. Yard sales - If you really want to find a deal, get in the habit of perusing your local classifieds for baby girl clothing. In addition, if you purchase several items at one time, you may be able to negotiate an even better deal. Online boutiques - If you really want to find that "something special", check out the variety of children's clothing boutiques online at sites like Tiny Tot Dress Shop and Sophia's Style. Finally, don't forget about popular stores, including Gap, Gymboree and, of course, The Children's Place, where you can usually find a great selection of dresses perfect for baby girls. With so many styles and places to shop, finding a dress for that special little girl might not be as difficult as anticipated. In fact, you might wind up bringing home a closet full of pretty dresses that will make her the best-dressed baby in town.